You know it’s summer in Seattle when the Bite of Seattle rolls around. Held at the Seattle Center, this annual, three-day event is a time to let your taste buds do some experimenting. The Bite of Seattle is always held in July, which means the hot Seattle sun is out in full force. 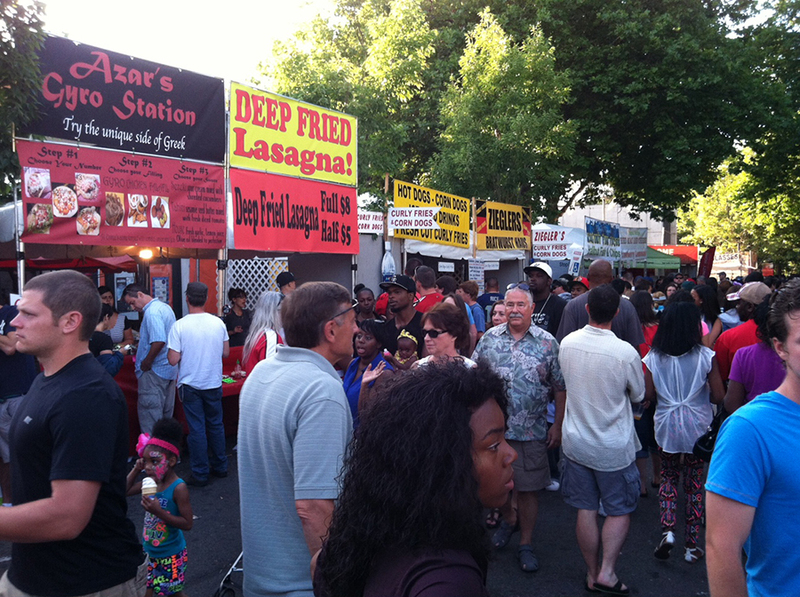 Food booths fill the center, attracting people from all over the city. The food is delicious, sometimes crazy and wacky, and the options are endless. Seattle Center is packed with people during the Bite of Seattle. There are a lot of different types of food at the Bite of Seattle. You’ll find the very traditional fair food — corn dogs, curly fries, burgers, elephant ears, and strawberry lemonade. There’s also a great diversity of food. You’ll see everything from Cajun, Asian, BBQ, Thai, Russian and so much more. While some of the food booths appear to travel around from one festival to another, other booths represent a variety of local Seattle restaurants. Some of the highlights include Chutney’s Queen Anne, Wings & Rings, and Relish Burger Bistro. There are always some wacky options that reel people in at the Bite of Seattle, including deep friend mac and cheese, fried peanut butter and jelly sandwiches and even elk burritos. There are also plenty of booths at the Bite of Seattle selling desserts, novelty food items and drinks. The food booths offer both small bites (hence the name Bite of Seattle) and larger portions. The smaller bites allow you to try a bunch of different food without getting too full with one meal. I snapped a picture with Tom Douglas at Bite of Seattle’s The Alley Hosted by Tom Douglas. 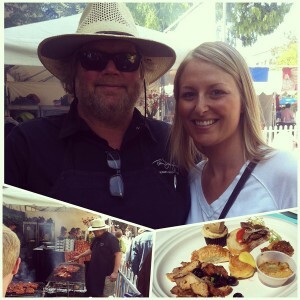 Our favorite part of the Bite of Seattle is The Alley hosted by Tom Douglas. For those who don’t know, Tom Douglas is a James Beard Award winning chef based in Seattle. Every year during the Bite of Seattle, he brings together iconic and up-and-coming Seattle restaurants to raise money for a Northwest charity. For ten dollars, you get a plate full of small bites from seven different restaurants. The bites are unique, delicious and leave you wanting so much more. Plus, the menu changes every day of the event. The most fun part about the entire experience is Tom Douglas is usually there cooking! I snagged a picture with him while he was taking a break from barbecuing some pork shoulder. 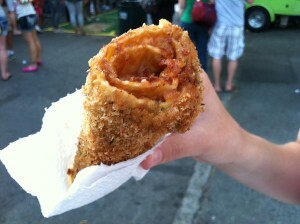 This deep fried lasagna tasted just like a giant cheese stick with pasta sauce and meat. 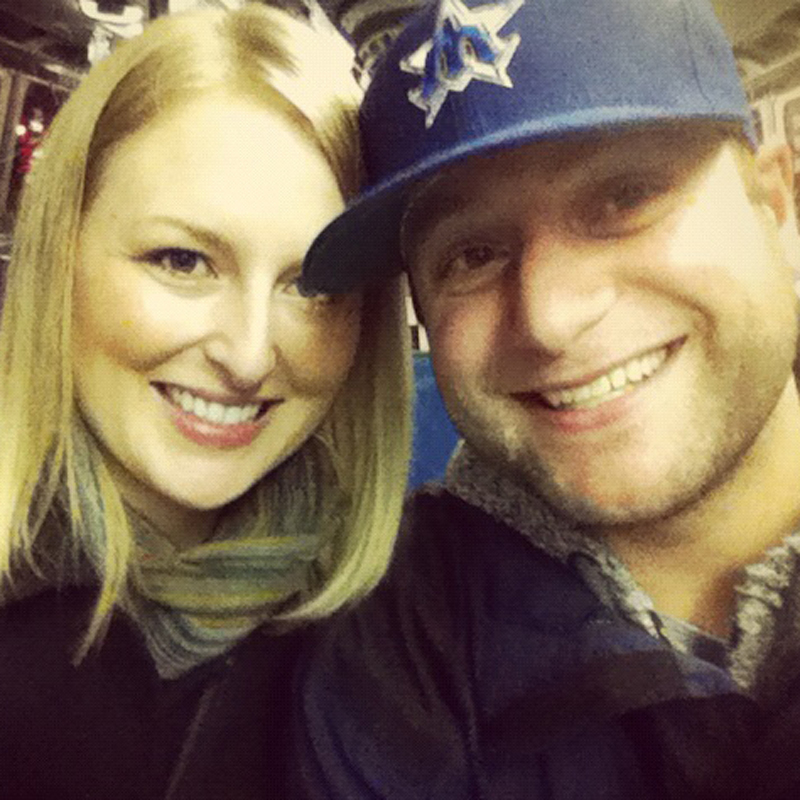 Since Tim and I enjoy eating and discovering new food, we visit the Bite of a Seattle a few times over the weekend. We’ll hit up The Alley one day, and then test taste everything else another day. With cash in hand (some of the booths take cards, but cash is the always the easiest), we walk around the Seattle Center, drooling at all the options. This year, our first stop was at a booth selling deep friend lasagna. Neither of us had ever heard of deep friend lasagna, so we had to dig in. It was awesome! A few people said, “Gross!” but it tasted like a glorified cheese stick. The oozing cheese, mixed in with the beef and pasta sauce was a great way to start our Bite of Seattle food tour. Goldbergs’ Famous Delicatessen won the Bite of Seattle Best Dessert Award for their coconut cake. After we finished the lasagna, we stopped at Goldbergs’ Famous Delicatessen. The half Reuben sandwich looked delicious and Tim and I couldn’t pass it up. The meat was stacked a mile high on the toasted bread and served with a big pile of warm sauerkraut. While we were ordering, I noticed a small sign at the booth saying Goldbergs’ won the Bite of Seattle’s “Best Dessert Award” for their coconut cake. Tim and I both agreed pretty quickly that we had to try it. The Reuben and the coconut cake were both to die for. It was one of the best Rubens I’ve ever tasted. 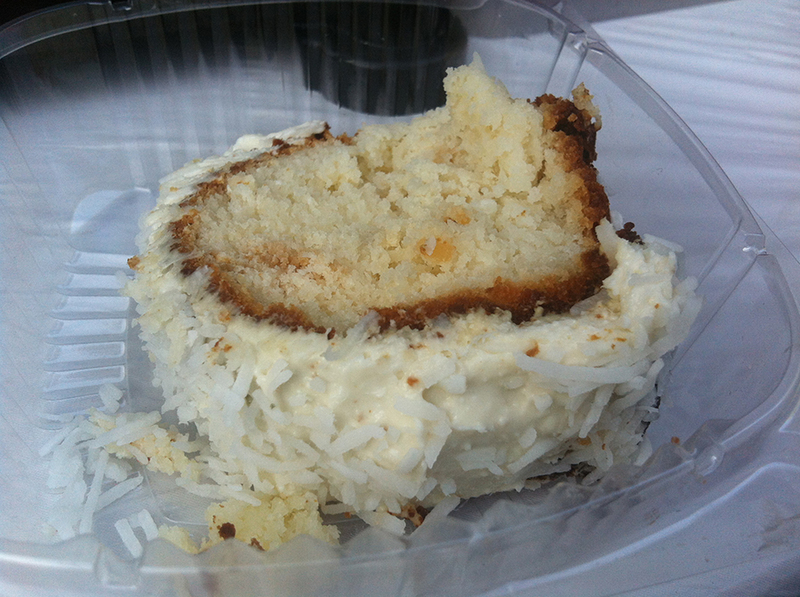 But the coconut cake stole the show for me. It was extremely moist and had the perfect amount of coconut. I will definitely visit Goldbergs’ Famous Delicatessen (located in Tukwila) to enjoy that cake year round. Tim and I both loved the roasted corn. Next up, Tim and I wanted to try something Russian. We went to Kaleenka Piroshky and ordered a salmon and cream cheese piroshky. We debated if we should get the salmon or the beef and cheese. While the beef and cheese piroshky is more traditional, we figured the Bite of Seattle is all about trying something new and different so the salmon made the most sense. The piroshky was good and fresh. You could tell it came right out of the frier. We ended our Bite of Seattle food tour with roasted corn. There were a few different booths selling it, and the lines were long. The roasted corn is definitely a crowd favorite and for good reason. 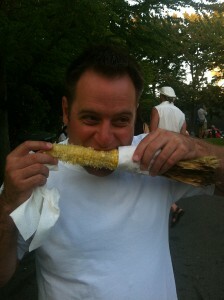 Nothing screams summer more than fresh corn on the cob. In additional to all the great food at the Bite of Seattle, there is plenty of live music and beer gardens scattered throughout the Seattle Center. The place is slammed with people. If you want to avoid crowds, you should visit when the Bite of Seattle opens every day at 11am. Since Tim and I love food, and trying new things, the Bite of Seattle is perfect for us. There is always something new and interesting to try. We also love discovering new restaurants in Seattle at this event, so it’s a must for us every summer. Have you ever enjoyed the Bite of Seattle? What is your favorite food to chow down on? We’d love to hear from you! Please leave a comment below or connect with us on Twitter, Facebook and Google+. Don’t forget to also check out Seattle Bloggers for more fun events around the Emerald City! We too hit up the Bite this weekend, and are big fans of the “The Alley”. Love how you get all those bites at once, and you can sit down are really dig in and enjoy! I also was huge fan of the fried cheese curds from the Monte Cristo food truck. Yum! We’re glad to hear you enjoyed the Bite this year! “The Alley” was definitely the highlight for us, but mostly because Tove got to meet Tom Douglas. How in the world did I miss the fried cheese curds? I was born in Milwaukee, so I can usually hear cheese calling my name from a mile away. I guess I’ll have to track down the Monte Cristo food truck around town. Thanks for the heads up!